These days, we are in a constant state of trying to get rid of things. I have too much crap. Our method, imperfect as it is, is to try to rid ourselves of one thing a day, thirty things per month. Most of the items are small and just get donated. But when an item we own actually turns out to be worth money (this is rarer than it should be), we have to decide whether to keep it or try to make some cash in a sale. This makes for some interesting decisions, as the ongoing process of selling and donating things requires a tricky first step: deciding how to value an item. Luckily, Adam Smith has given us two concepts that help make that decision easier: Use Value and Exchange Value. The word value, it is to be observed, has two different meanings, and sometimes expresses the utility of some particular object, and sometimes the power of purchasing other goods which the possession of that object conveys. The one may be called "value in use", the other, "value in exchange." The things which have the greatest value in use frequently little or no value in exchange; and on the contrary, these which have the greatest value in exchange have frequently little or no value in use. Nothing is more useful than water: but it will purchase scarce any thing; scarce any thing can be had in exchange for it. A diamond on the contrary, has scarce any value in use; but a very great quantity of other goods may frequently be had in exchange for it. Exchange value is an easier concept to understand: it is simply the price an object or service will fetch when sold. There's obviously some wiggle room here, with the realization that different buyers are willing to pay different prices and the ever-present possibility of negotiation. But while the price itself is a bit of a variable, the concept of exchange value is a simple one. Let's take our scooter as an example. Today I looked up the Kelley Blue Book Value for a 2007 Yamaha Vino in excellent condition, and I see a price of $1,390. Depending on the circumstances, I might sell it for as little as $1,100 or for more than $1,500; but whatever figure I can actually sell it for is the exchange value. Savings Over Useful Life (SOUL): One way I like to calculate use value is to determine how much its use will likely save me over the life of that object. Let's look at the scooter example again. In a rough calculation of total cost of ownership, I can expect to save $250 for every 5,000 miles that I ride the scooter instead of my car. If I ride approximately 5,000 miles a year and I assume the scooter will last for five more years, I can estimate the savings over its useful life, and thus its use value, to be $1,250 ($250 x 5 years). Worth Over Useful Life (WOUL): But what if the item doesn't have any hard-dollar savings, but still is worth something to the owner? Or what if the scooter is worth something above and beyond the money it saves us? What about the fact that riding a scooter is fun? Another way to think about use value is to ask what you would pay to use or own an item, and then calculate that figure over its useful life. For example, I like the painting of a tree that I keep over my desk. I've had it for years and even though Mrs. DB40 thinks its a bit of an eyesore, I get some enjoyment out of it. Let's say that painting is worth $20 a year to me. I'd pay $20 a year to rent it and continue getting the pleasure of seeing it every day, but no more (since I'm cheap). And let's assume the painting can reasonably be expected to last the rest of my life: say, fifty more years. So in this case, the painting's worth over its useful life, and thus its use value, is $1,000 (in non-inflation adjusted dollars). These are all pretty subjective valuations, but since the decisions to keep or sell the items you've accumulated over the years are personal, the valuations have to be similarly personal. If I am considering selling a piece of furniture that a relative left to me in a will, I need to be honest about what that furniture is really worth to me. The method we use is to compare the long term Exchange Value to our calculation of the Use Value. So in the calculation above with my painting, if I can only sell it for $100 and I think it's really worth $1,000 over its useful life, then the exchange value is less than the use value, and I should keep the painting. Right? Not exactly. The final step is to consider what I'll do with that $100 I would get if I sold the painting. Assuming I'm in a position to invest the $100 (and not spend it on some other thing), and assuming a 7% annual gain, over the 50 year useful life of the painting, the true exchange value is $2,946, not just $100. This obviously heavily skews our decisions towards selling items, since we can reasonably assume that any money gained from selling an item is going straight into our early retirement funds. And this is at least part of the reason we are trying to own fewer things. I do get a lot of satisfaction from bringing boxes to the donation center or selling an item over Craigslist. And it's nice to have less clutter. But when we consider the fact that even a small investment into retirement funds can pay huge returns over the rest of our lives, in most cases I'd rather have (and invest) the cash than to have one more tchotchky in the house. Astute readers will note that this means the math points us towards selling the scooter, as the $1,390 in a sale translates to $1,950 in real exchange value over five years. Much more, if we extend that investment over the next fifty years of our lives. And to those astute readers, I say, "Shut your stupid face." It is my scooter and I am keeping it. Thanks, as always, for reading. And if you haven't yet, Mrs. Done by Forty and I would love it if you would click the link up on the right to "like" the blog on Facebook. Thanks! *Photo is from jimmy brown at Flickr Creative Commons. Thanks for the kind words, MSquared! Any rationale to have fewer things is probably a good one. Let me know what you end up getting rid of. I'm with MSquared! Shut your stupid face was my favorite part. That is really smart of you guys to invest that money and not just let it slip through the cracks of the budget. We try to put money from what we sell in wise places in our budget, but haven't done the investing thing, yet. New goal! That's great, femmefrugality! I'm glad to contribute just a little bit to your 2014 goals, and thanks so much for the nice comment. We're trying to figure out these kinds of calculations on the jeep... But unlike the scooter every ride that we take in the jeep instead of my car costs about twice as much. But it's also a really fun way to ride around town on the weekends - there's nothing like taking the doors off and riding out into the Glades a little. I'm always amazed at your savings rate so you should splurge. Life's too short to worry about everything. I have a deal with my wife, you want something expensive put some money in an investment account and you can buy it when it achieves that price. Let's see if we can pave our driveway with that philosophy. I love that approach you're taking with the driveway, Charles. We're doing something similar for our next property purchase, but I have been chewing on your ideas for a long while and definitely can see the value in what you've suggested with using leverage via a HELOC and making a cash offer, then repaying the HELOC. Very smart. There is a part of me that knows you are right and that life is too short to worry about stuff like this. But I do get a weird pleasure in just the analysis of things. I like optimization for optimization's sake, you know? Use a cash offer and bid 10% less. Once the property closes do a cash out refinance on the investment property. The bank will lend you 75% of the value of the house. Pay you HELOC back. Rinse and repeat. Start with 1 t based on what you want you can probably get 3 that way. Charles, I like the approach. Do you typically find you can do these sorts of transactions without closing costs? Haha, "it's my scooter and I'm keeping it!". Sounds like that's a case of the value in use being about more than just dollars. Love the thinking here. I have to admit that I haven't often thought about my possessions in exactly this way but really should do so more often. Thanks for giving me something to chew on! Yeah, I unintentionally chose an object that would not yield to this analysis...lack of planning strikes again. I realized about halfway through that the scooter wasn't going to work as the only example, looked up and said, hey, how about that painting? I don't subject everything to this analysis: most of the stuff I look at and say, yep, you are destined for the donation box. But if I'm on the fence with something, or it might actually sell for decent coin, I'll do some quick math. Great post Done By, you did a great job of painting a picture of how to value something. Love the analogy of valuing your scooter by how much it saves you in a year. Shows there is a deeper meaning to the things we invest in. Thank you, Jim. Yeah, there are definitely things that have a deeper worth. In retrospect though, the means of reducing that to dollars is a little crude. I wish I'd come up with a more elegant way of comparing relative worth. I am trying to clear out so much of the stuff that builds up over time. Thankfully very few of them actually require too much thought, or an analysis. I think that just means I have too much crap! I'm with you, Alicia. Most of the stuff we give away is just crap, too. Funny how we keep finding more of it! "Shut your stupid face." - well if that isn't a meticulously calculated justification, I don't know what is! ;) I dislike clutter, too, so we do our best to do regular sweep of "do we need this?" so that we can either give it away to charity, try to make $ from it, or toss it. That's a great point about small investments leading to huge returns in the long run! I had to triple check my math on that $100 invested over 50 years. It still doesn't seem right, but I guess I have to trust the calculator. Sometimes we have to just ignore the cold calculations and just go with what makes us happy. I would keep the scooter, too. Thanks, Bryce! I agree...there's a real value in putting down the spreadsheet and the calculator. There's probably a blog post in that idea somewhere. 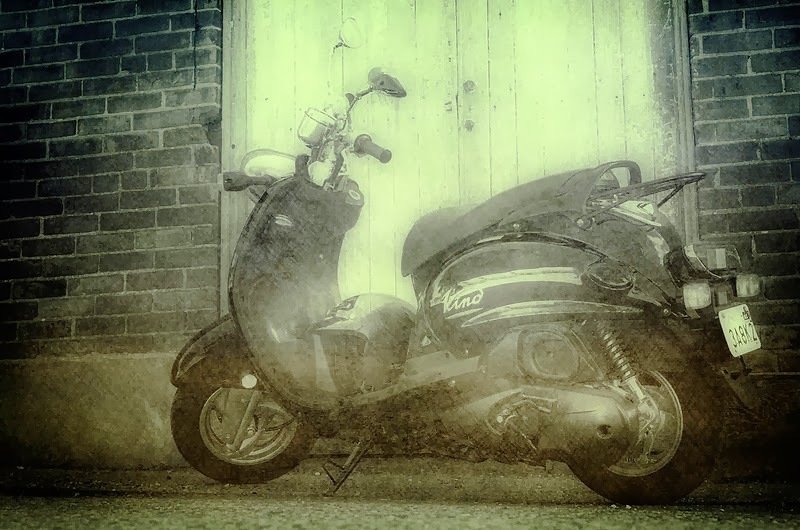 Haha, great read, Done by Forty :) You guys are clearly serious about clearing out what you don't need, which I think it great - but the example of the scooter is a good reminder that we don't have to get rid of EVERYTHING that we don't need to get by! I really liked how you worked out the value with the calculations, too - I typically don't think of "clutter" or items to get rid of in that way, but that's really useful. Thanks so much for the kind words, Laura! We love to hear those. I think the post probably could've been improved with a bit of a threshold, under which it wouldn't make any sense to bother with these sort of calculations (say, $5 or $20). When dealing with the small stuff, sometimes it's best just to get rid of it if it's not sentimental, or to keep it if it is. As always, you write the most intriguing, at the same time, informative post. I'd start reading with an eyebrow raised and often would end nodding in agreement. This time with a big belly laughter and a quick look at the mirror to check my stupid face - super lol! :)) I would be looking at my treasure (pronounced as clutter) and start doing the math. Aw, Jen, that was the nicest comment! I'm happy if I can write a post that is either interesting or funny. If I can do both, it's time to buy a lottery ticket. One step at a time, right? Sometimes I think I could do away with this analysis and get rid of just about everything. It might do pretty well there in NYC, too! Merry Christmas. A long time ago I discovered Flylady http://www.flylady.net/. I started using her ideas, and one of the things that stuck with me is her idea that if something doesn't make you smile, pitch it! I am amazed at the amount of stuff I can get rid of that way. Sometimes I replace the item with something that does make me smile, and sometimes I find that less is more. Either way, our home is a happier place! Thanks so much for the comment and the suggestion. I am going to try the 'smile test' on some items in my house when I get back.